Danone is stepping up its targeting of health workers and the public around the world, in violation of international baby milk marketing standards. In the UK Danone’s formula brands are Aptamil and Cow & Gate. Help expose what Danone is doing where you see it sponsoring health worker events and charities. Say NO to formula company sponsorship – say DanoNO! Baby Milk Action is organising protests where possible to raise awareness of the conflicts of interest involved in having a formula manufacturer and distributor as a sponsor and to prompt a debate. We are also alerting people to the fact that the First 1000 Days slogan has been hijacked by Danone. People signing up to receive emails from the website https://www.first1000days.ie/ are not informed this is a Danone initiative. Nor is this mentioned in the emails. It is only when you check the Privacy Statement that you see Danone is behind the initiative and uses your data to target its advertising. 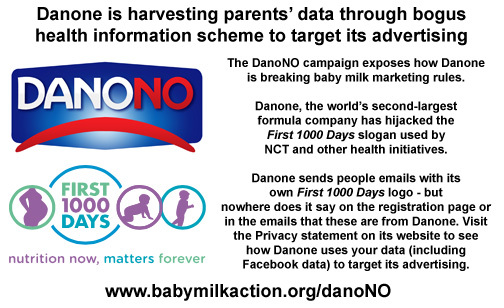 Help alert people that this initiative is being used by Danone to harvest parents’ data for marketing purposes by sharing our infographic (click on the image and retweet). Help Baby Milk Action monitor the baby milk industry and expose unethical practices. Danone is already involved in a formula marketing war with Nestlé in many countries. It is the second largest company in the global baby milk market and a significant source of violations of the International Code of Marketing of Breastmilk Substitutes and subsequent, relevant Resolutions of the World Health Assembly. For recent examples of Danone’s aggressive marketing, see our UK Monitoring Report 2016. For practices around the world, see the front-page story in The Independent on its practices in Turkey, Save the Children’s recent report on infant and young child feeding and the monitoring reports from the International Baby Food Action Network (summaries can be downloaded by clicking here). 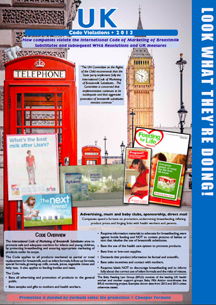 The report Look What They’re Doing in the UK 2013, published by the Baby Feeding Law Group, gives examples of the marketing strategies used by Danone and other companies, which violate both the Code and Resolutions and national measures. We are finding Danone is becoming more aggressive in the UK, perhaps due to Nestlé’s entry into the UK market following the completion of its takeover of Pfizer Nutrition/Wyeth and the SMA brand of formula (we have a Say NO to Nestlé campaign). Accordingly, we are organising protests outside events for health workers and the public sponsored by Danone to raise awareness of the conflicts of interest involved. The World Health Assembly has addressed the issue of sponsorship in Resolution 49.15 from 1996 and again in Resolution 58.32 from 2005 where it stated : “ensure that financial support and other incentives for programmes and health professionals working in infant and young child health do not create conflict of interest”. Article 5.5 of the International Code of Marketing of Breastmilk Substitutes prohibits companies from seeking direct or indirect contact with pregnant women or the mothers of infants and young children.